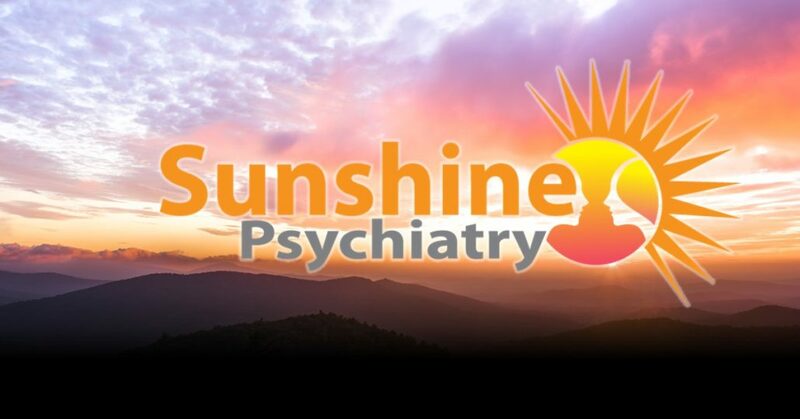 Dr. Sahar Douek was preparing to start her own psychiatry practice, Sunshine Psychiatry. She needed a logo and website that would present her philosophy and expertise, on a new-business budget. Dr. Douek contacted us after a referral from another established medical professional. 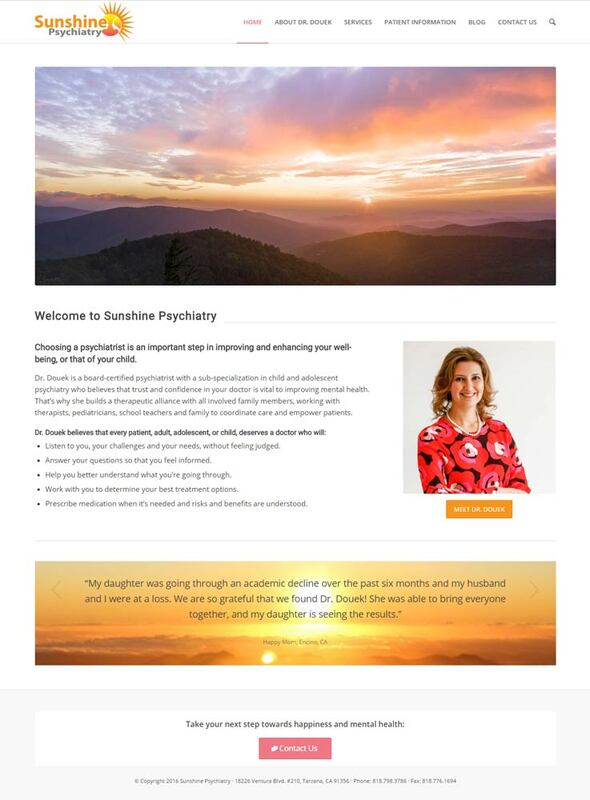 Speed of Like worked closely with Dr. Douek to create her new site, including a new logo, new taglines, structure and copywriting that she could then use in printed materials and other places in her physical office space. A custom template was created to project the serene, hopeful feeling that Dr. Douek wanted for her practice, which caters to young adults. At the same time, the design had to look professional and connote trustworthiness. Speed of Like advised Dr. Douek and guided her through the logo creation process, achieving a result that was reflective or the practice’s business and goals: improving mental health and providing hope for a better tomorrow. Speed of Like created elements throughout the website to showcase Dr. Douek’s expertise and reviews from patients and colleagues. Scholastic and medical accreditations were added to the About page to demonstrate Dr. Douek’s knowledge and expertise. A banner area with links to maps, a contact form and a phone number that is clickable from mobile phones and devices with telephony enabled. 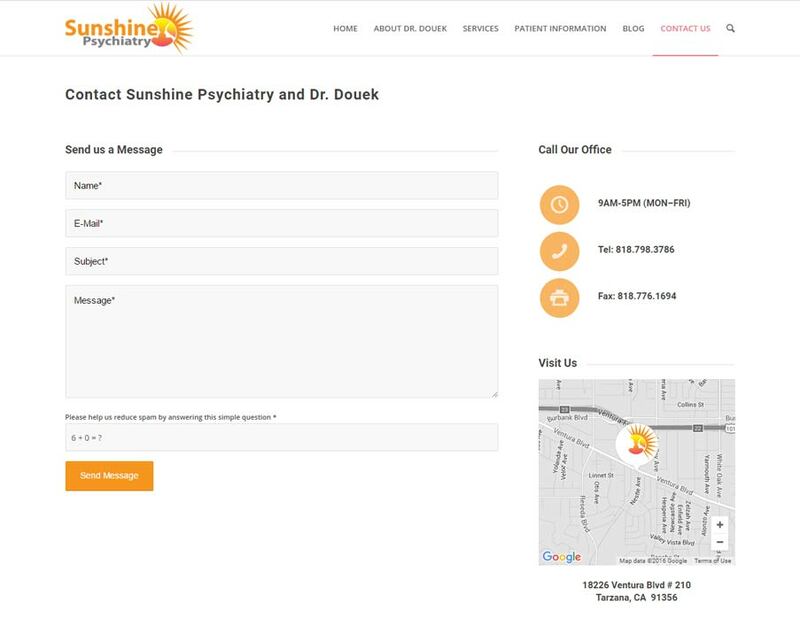 A contact page with all methods of contacting Sunshine Psychiatry was clearly laid out, including a customized Google map to make finding her office as simple as possible. 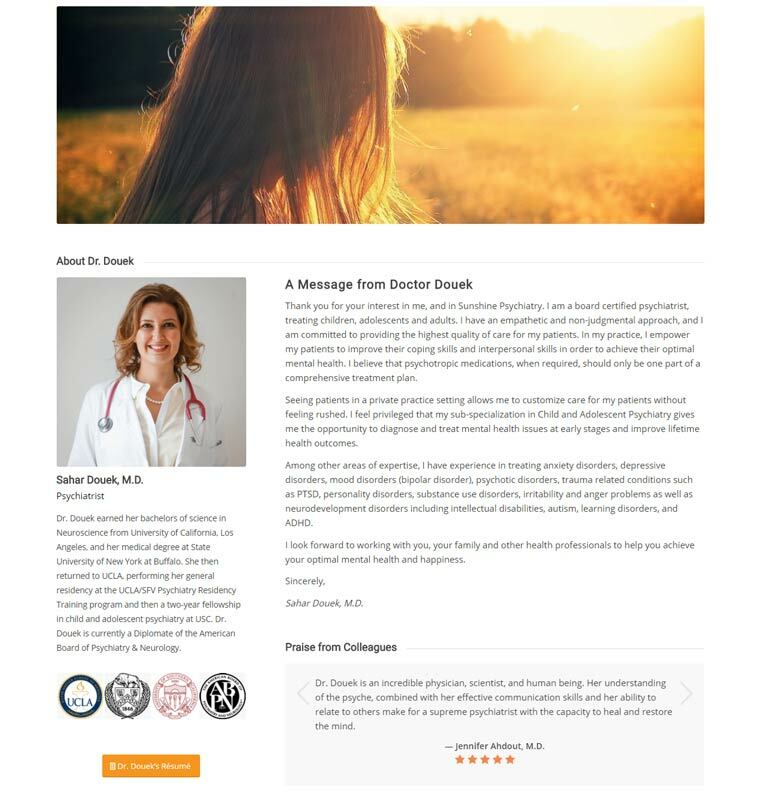 Calls to action were placed on every page of the site to encourage prospective patients to connect with Dr. Douek. An about page for Dr. Douek that features endorsements from colleagues and icons for her impressive educational institutions. Contact page featuring a simple-to-use contact form, clickable phone number and interactive map. “Boris was professional and knowledgeable. He helped me shape and refine my idea for my website, and worked with me on the documents I sent to him, always responding quickly. My website looks great and it exceeds my expectations! Interested in how we can help establish and grow your medical practice? Keep up with the latest new and tips to maximize your online presence! Tell your story, engage your audience, grow your business.